Posted December 30, 2016 A Water Island legend has retired! 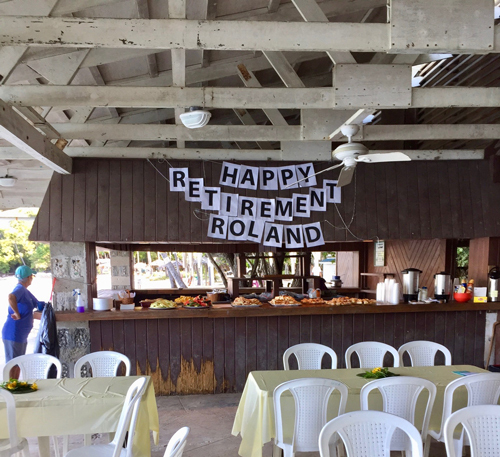 Roland's last day working on Water Island, AFTER 54 YEARS, was celebrated with a surprise breakfast get together at Honeymoon Beach. 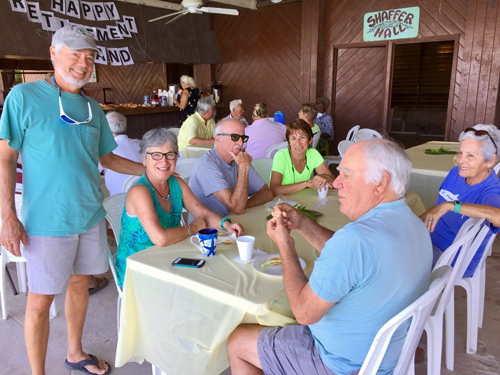 Many Water Islanders came to help celebrate Roland's retirement. 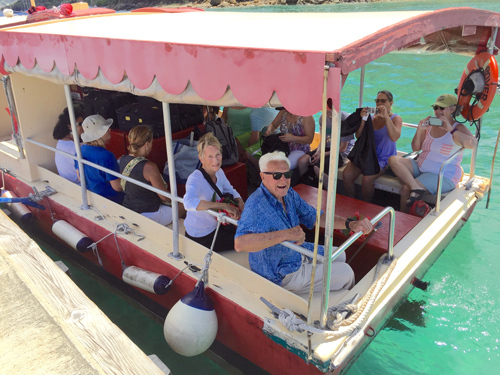 According to Roland, over the past 54 years he has worked at every house on Water Island. We wish you well in retirement Roland! c. The signed proxy can be scanned and sent to the email address RockyDock@gmail.com as an attachment. 2. Or, by going to http://www.waterislandwica.com/WICA the capability exists to complete and submit the Proxy on-line. Thank you, and we look forward to seeing you at the meeting. Posted December 21, 2016 It is with great sorrow that we announce that Genevieve Alexander has passed away. Such a wonderful friend. We will miss you but never forget you Genevieve! Posted December 16, 2016 It’s that time of year again! The 6th Annual Water Island Christmas Musical Light Show starts Tues. December 20 at 7 PM (Dunakey’s Driveway). The schedule is also posted at the ferry dock and on the wall at Dunakey’s. All shows will be every evening at 7:00 PM with two exceptions, Christmas Eve at 8:45 PM and New Years Eve at 9:15 PM. 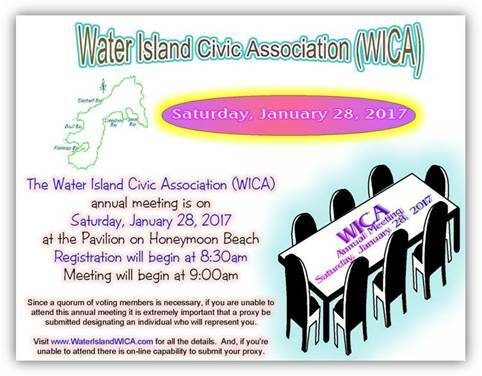 Posted December 4, 2016 There will be a year-end WICA Executive Meeting on Saturday, December 17, 2016 at 9:00AM. 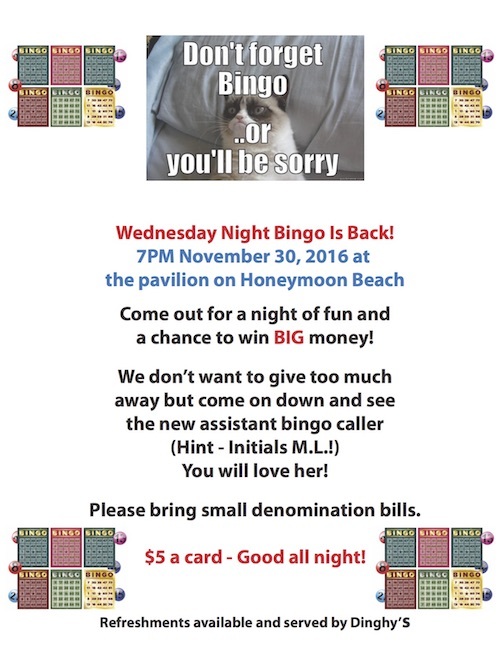 The meeting will be held at Shaffer Pavilion on Honeymoon Beach. On SUNDAY, December 4, at 6:30 p.m.at Honeymoon Beach, WATER ISLAND LUMINARIES will be lit on the beach in our effort entitled “Let Hope Light Up the Night”. The price of the luminaries is 4 for $25 or $10 for one (1) and they are available through Randy Coe (690-2772 hsewrks@gmail.com ) or Colette Monroe (690-6010 colette.monroe@go.vi.gov). For those who are off island, send an email with the names to be put on your luminaries and mail a check to ACS USVI at the address below with WATER ISLAND LUMINARIES noted. 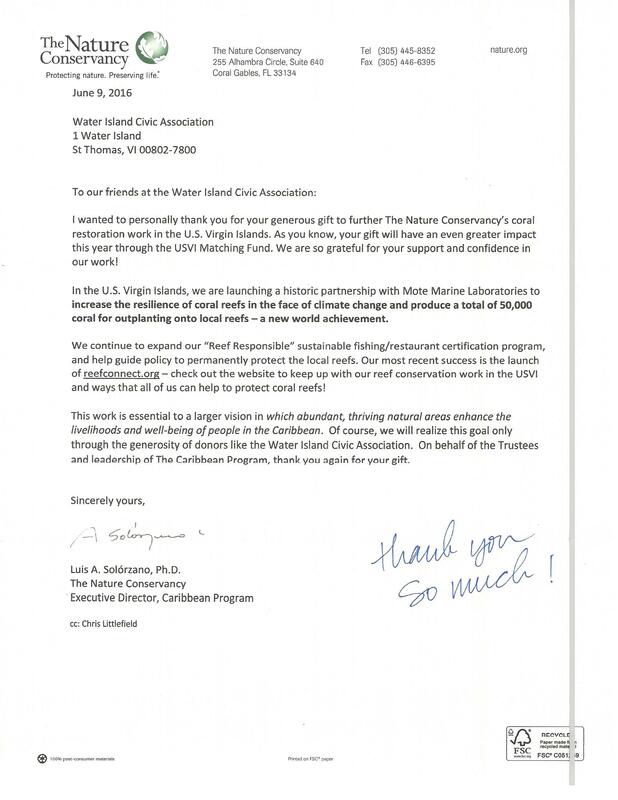 Currently, all of the funds raised on St. Croix, St. John, St. Thomas, and Water island are spent in the USVI. A portion of these funds are used to provide patient financial assistance through the Financial Assistance Program (FAP). ACS USVI provides cancer information and support through 1-800-227-2345 or visit www.cancer.org. Our phone lines are open every minute of every day to give people the answers they need about cancer. • In 2014, ACS USVI distributed $125,028.88 in patient financial assistance (FAP) to constituents and also provided a grant in the amount of $25,000*. 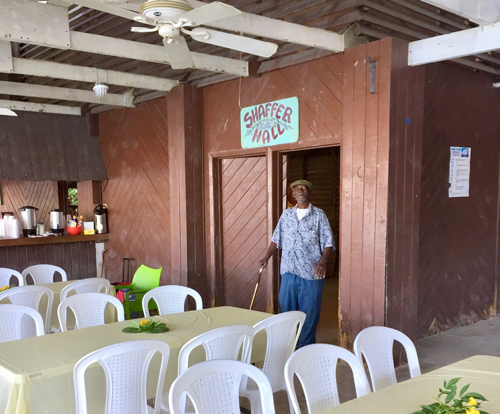 • In 2015, USVI distributed $142,747 in patient financial assistance (FAP) to constituents and also provided a grant in the amount of $50,000*. ACS USVI provides a $50,000 grant to Cancer Support V.I. 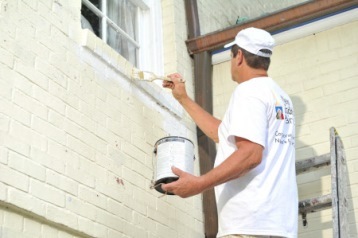 through the Community Foundation of the US Virgin Islands. The grant has been used for items that ACS does not cover within the Financial Assistance Program policy and is used exclusively for USVI cancer patients. There are two ACS USVI offices, one on St. Thomas in Wheatley Shopping Center in Estate Thomas, and on St. Croix in the Sunny Isle Professional Building. 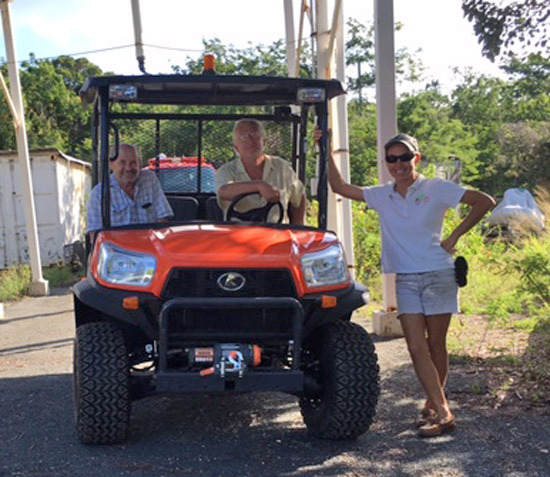 ACS USVI employs four staff members. The ACS USVI has a volunteer leadership Board of Directors comprised of 11 dedicated professionals from the public, private, and civic sectors across St. Thomas, St. Croix, St. John, and Water Island. • Working with partner health providers in the U.S.V.I. (Kimmelman Center, VI Community Foundation, I.C.M.C. The ACS USVI Financial Assistance Program is available to all US Virgin Islands residents diagnosed with cancer. Priority is given to 1) Newly diagnosed cancer patients; 2) Patients with recent recurring cancer; and 3) Uninsured, under-insured, and underserved. • Active treatment; • Nutritional supplements; • Medication for pain management, treatment and/or treatment side effects; • Medical supplies including diapers, under pads, gloves, gauze, etc. ; • Durable Medical Equipment such as wigs, prosthetics, wheelchairs, etc. ; • Studies and/or laboratories directly related to the cancer diagnosis and its treatment; • Ground and air transportation expenses related to treatments, and • Mammograms – year-round, free mammogram vouchers are given to the uninsured and under-insured, and honored at participating local entities. American Cancer Society – US Virgin Islands (ACS USVI) is a 501c3 non-profit corporation and all donations are tax deductible. Thanks for your help. I will also be at the Art Show on Sunday and will have the luminaries then. Posted November 23, 2016 The Water Island Holiday Season will officially kick off with the Tree Lighting Ceremony at Bob & Joanne Bohr's home on Sunday, November 27th, 6 to 8PM. The tree will be lit at 7PM. Everyone come out and help start the Season! 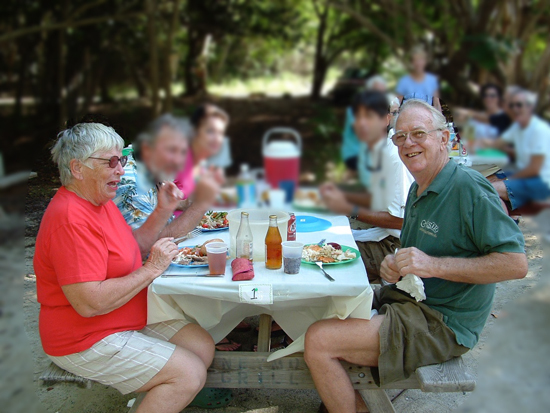 The Bohr's are kind enough to open their home to all Water Island residents and guests for this event every year. Refreshments will be served. Thank you Bob & Joanne! Posted November 8, 2016 There will be a WICA Meeting this Sunday, November 13, 2016 at 9:00AM. The meeting will be held at the FIREHOUSE. It is with much sadness and sorrow that I share with you the lose of my father Gunter Karl Hoepfner, born June 28, 1926 in Germany. 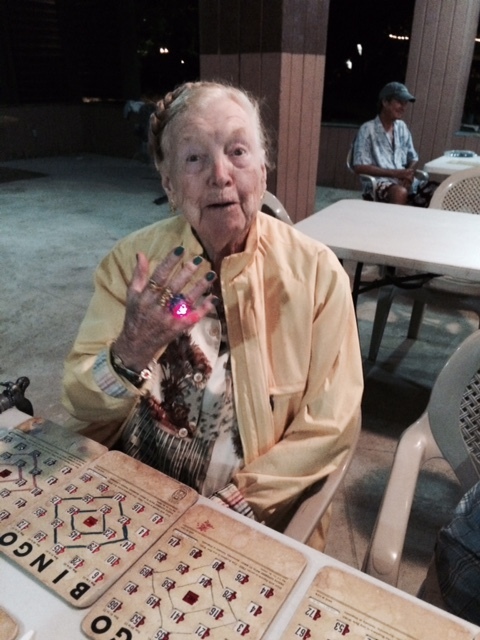 He celebrated his 90th birthday this past June with all his family in attendence. He died peacefully at his home in St. Charles, IL yesterday, Monday Sept 26th at high noon. He shared this home with my mother Margot for the last 46 years. My parents would have been married 65 years this November. He came to Water Island courtesy of Sea Cliff Hotel and fell in love with our little gem. He bought 2 subleases in 1978 and 1981 , Walter Phillips suggestions, and began building 2 homes, Pelican Point in 1985 and Sea Breeze Villa in 1995. Sea Breeze Villa is my fathers legacy to me and I will treasure it forever. I will be the caretaker for the next generation for the home my father built with his heart and soul! With my mother Margot, myself and my husband Mark, my brothers Arnie and John, and their wifes, Paula and Terrie, we are all sad with his death but happy that he was able to leave this earth on his own terms and own time. I spent the last few months taking care of him 24/7. I feel blessed that I was able to spend such quality time with him in the last few months of his life. He was able to take one last visit to the island he loved this past May. A fond memory that I will always have is of him floating on his back in the water at Honeymoon Beach and telling me "This is so nice and peacefull". He never liked weddings or funerals so we are honoring his wishes. But he will return to Water Island with some of his ashes blown to the wind! Thank you friends for all your support and prayers! Posted September 26, 2016 We have learned that the 2016 Property Tax Bills have been mailed out by the VI Government. Unfortunately many residents & property owners on Water Island have not received the bills. 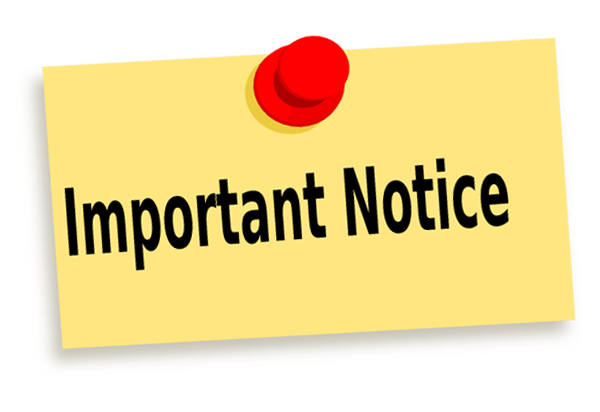 It is VERY important that you contact the VI Tax Office at Tel# 340 776 8505 if you have not received your bill. 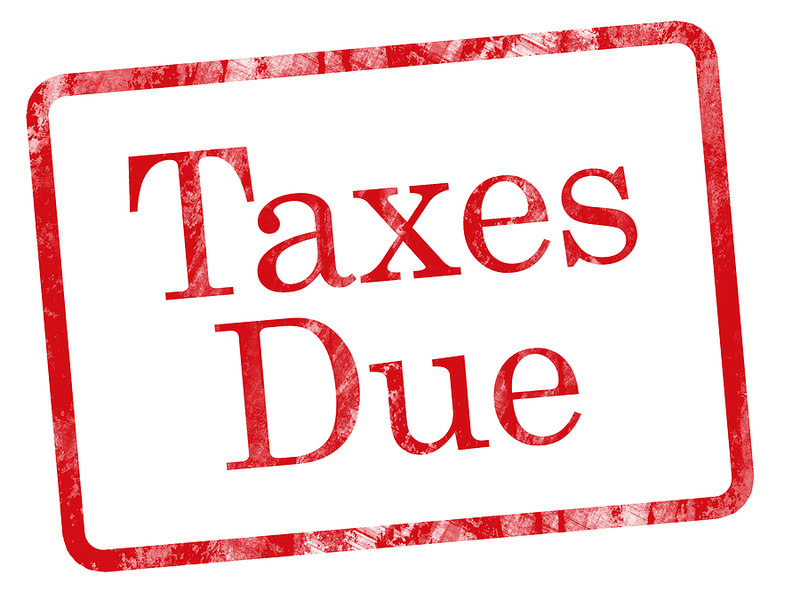 The deadline for paying the tax is September 30, 2016 to avoid becoming delinquent and having to pay late payment charges of 1% a month. Posted July 28, 2016 The below email from Bob Jackson is being posted at the request of WICA President, Joanne Bohr. Thank you for the update Joanne! Thanks for the heads up. I know that everyone gets frustrated with the amount of time it takes to put such a complex development together, no one more than us. We have spent the past 8 months working to select a hotel brand & operator. This is a key milestone since the selected brand will be integral to the next steps in design and planning. The selected brand will provide their technical services team to work with WIDC and our architects, engineers, land planners and ultimately contractors to insure that the finished product is a stunning yet practical and sustainable hotel / resort. Our selection process started with identifying 17 potential brands that might be good candidates for Water Island. We whittled the list down to the 7 brands we thought made the most sense and invited them to see Water Island. During the spring, we conducted site visits with key staff from the shortlisted brands. We received six Letters of Intent from the shortlisted brands. Subsequently, we reduced the shortlist to two brands and had further discussions with both over the past 60 days. We are finalizing negotiations with our preferred brand over the next few weeks and expect to announce the brand selection in September. 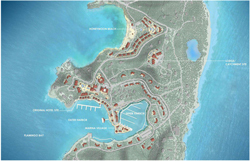 This is a very important step in insuring the quality and success of the Water Island hotel / resort. We are taking every precaution to make sure we get it right. Honeymoon Beach is a Little Safer! Posted July 23, 2016 We don't think you will hear, "Look out for 'dem coconuts" for awhile! 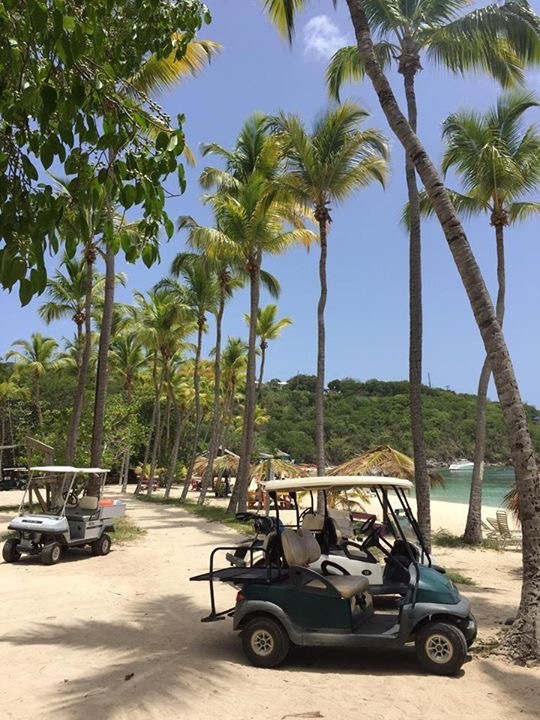 A BIG "Thank You" goes out to Rachael Ackley for coordinating the cutting of the Palm trees on Honeymoon Beach. 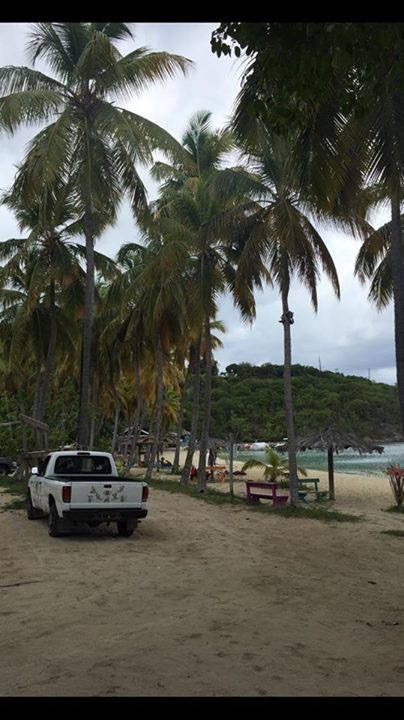 With the help of generous donors the Water Island Civic Association (WICA) was able to facilitate getting all the Palm trees cut AND refurbishing some of the palapas on the beach. Big thanks to Kevin Wenk who put together the crew and the truck. Thanks to Shane brown (who also climbed and cut trees as well as removed debris), Noah Mydlenski, Chris and Nick Exton, and Dalton Parr, who all worked really hard to clear away the palm leaves and coconuts on the ground in a timely fashion. And, Doug Ackley who was "Safety Sheriff", making sure the area was cordoned off for safety and kept people away from falling nuts! Posted July 15, 2016 If you are having any work done at your house or property it is always best to use workers that have been recommended by someone. Being a small island we develop a network of trusted workers/companies that provide a wide range of services, house painting, electrical, landscaping, etc. Ask a neighbor or a friend and they probably have a good recommendation! In spite of the lack of notice (we heard it as a rumor on Friday the 24th); and there wasn’t an official meeting notice was ever sent out by DLCA, nor a planned agenda, it was a one of the largest turnouts I have seen! 18 representatives from VI Government came over to attend. (Including Senators Millin-Young, Harrigan and Ford!) We will get the sign in sheet for the town meeting from DLCA later. DPNR did not attend which would have been the only one that was not represented who has a voice on beach issues. I think it was almost evenly divided by Dinghy’s patrons and residents. Mr. Devin Carrington, DLCA Commissioner chaired the meeting and was very effective at controlling it. He identified himself as DLCA Commissioner and stated that he called this meeting he would be the only person in charge. He recognized the other VIG officials but initially did not allow them to introduce themselves. Mr. Carrington has been the DLCA Commissioner for one and half years, is from St Croix and it was his first time on Water Island. He stated that for several weeks there has been requests and correspondence coming into DLCA regarding Dinghy’s Beach Bar and he decided to hold a town meeting to listen to the concerns of the residents of Water Island. His introduction was that the only topic that was under discussion at this meeting was whether DLCA should grant Beach Life, LLC a Night Club License. Mr. Carrington then, with that brief introduction, opened the meeting with the invitation to individuals to speak for up to 3 minutes. As different individuals spoke in regards to Noise, Pollution, and non-compliance to covenants mandated by the Federal Government in the Transfer Deed, the common response from Mr. Carrington was that those areas were not under the purview of DLCA, and therefore were not an issue with making a decision about the proposed license upgrade. VIPD Police Chief Jason Marsh was allowed to respond to a question about an assurance of a Police presence on Water Island. His response was that it was something that could be looked into, but only after a decision was made by DLCA to grant the Night Club license. Much of the meeting went as you would expect. Residents concerned about noise, pollution and safety issues primarily. There was a rumor that there was an effort to shut Dinghy’s down entirely which was never the intent from what I heard—it was the Foxy’s-Soggy Dollar-nightclub plans that concerned almost all the residents. Mr Carrington quickly dispelled that there was an issue about shutting it down. The issue is ensuring the proper licenses are in place and monitored. Dinghy’s Isla and Lisa, with strong support from their loyal crowd expressed the need to have a lively event and music. Isla made a good point; many complaints come from the DJs and the obscene language and suggestive comments--- which is why the bands are preferable to DJs because it has been built into a fun event. That is why they need a nightclub license, so they can have bands. There were 2 opinions on nightclub rules. One official said only if residences are in 500’ and others said because it is W-1 a soundproofed building is required regardless of distance to homes. Lou from Tickles expressed the same concern and what he sees and how it is affecting his patrons. Differing opinions on ‘overserving/drunk people’ ensued. Isla maintains that many drink from coolers not at Dinghy’s and they cannot monitor ‘if they drink 10 drinks from their cooler and then go to the bar to have 3 more drinks it is not their fault’ Not all the intoxicated people on the beach are from Dinghy’s which is true and I don’t think anyone believed it is 100% -but many raised the overserving issue. Ms. Astia LeBron is the DLCA Public Relations person who organized this meeting in a matter of days and is very passionate about her job. She is a resource we should use for questions on licensing. I find her to be fair and objective on the issues. Astia stated that she had been receiving all the email correspondence and had read every one of them. She also, commented that in the last few days there was an overwhelming stream of emails supporting Dinghy’s Beach Bar. No indication of all those emails being shared to others. She received calls and letters in the past few months regarding Honeymoon Beach issues. This was the reason the various agencies were needed and the town meeting was called. The common theme was compliance with regulations that are there for our protection. That did come across well, in my opinion. Sports, Parks and Rec Asst Commissioner Calvert White introduced me to his assistant Gerald who will be assigned to be on Honeymoon Beach on busy days to ensure compliance with all regulations. That is a significant improvement and one we have asked for in past years. The VIPD Police Chief Jason Marsh and Deputy Chief Alcindor met with me and I introduced Joe Mancino so we have made some great contacts. In the meeting Chief Marsh indicated there are no plans to station officers on WI because it is up to the establishments to add security for events as needed. DLCA Officer Donovan also expressed how it has improved because he has access to a boat and knows it was a hindrance in the past. Thank you to all the members who wrote, pro or con because that is the only way we can get focus on what our issues are and open the lines of communication. Special thanks to Bob Bohr and Missy Pettit for setting up for the meeting! Also, Agi Rampino, Christine and John Black, Rachael Ackley, Bob Blosser and others for assisting with transportation at the last minute. And we cannot forget the technical audio expertise offered by David Roselle—without such, no one past the first row would have heard anything! 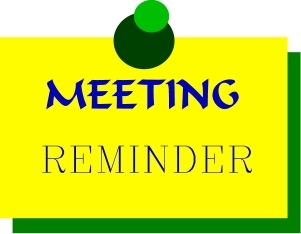 There will be a Town Meeting this Thursday, June 30, 2016 at 7:00PM at the pavilion on Honeymoon Beach. The Town Meeting, with various VI Government agencies, will be held to discuss residents' concerns, and a hearing to discuss Dinghy’s licence application. Posted April 25, 2016 Come on out to the firehouse on Tuesday, April 26th at 5:00PM to see the new WISAR fire truck in action! As an added incentive, if you come out you can get hands-on training! You never know when you might need it to save your house! Also, Check out these photos of WISAR Training recently completed! Posted April 15, 2016 The "End of Season" is upon Water Island as many of our wonderful friends head back to the States. Until next year friends. Stay well! Posted April 13, 2016 There will be a WICA EC meeting on Sunday, April 24th at 12 Noon at the FIREHOUSE. Come on out and be a positive force in the community! Posted March 31, 2016 As of 2:10PM today N. Limestone Road has been cleared! Posted March 29, 2016 There is a truck blocking N Limestone Road near Campground and Dunakeys. Providence Hill Road is the alternative. Fun At the 2016 WICA Annual Auction! Posted March 14, 2016 WOW!!! 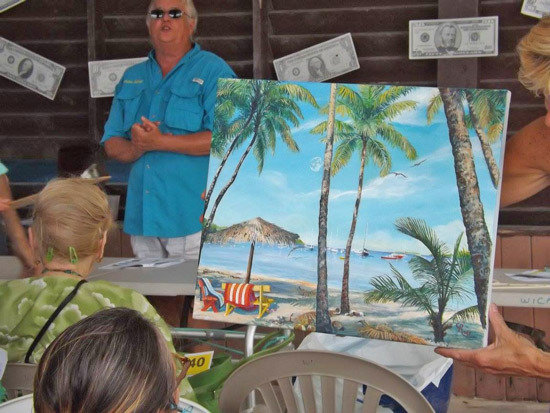 The 2016 Water Island Civic Association Annual Auction was so much fun, and, a big success! The effort was spearheaded this year by the amazing Mercy Blosser and her trusty side kick, Bob Blosser! 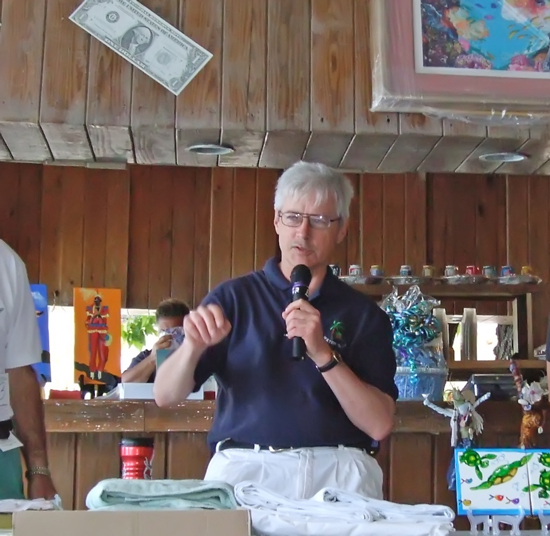 In addition to Mercy & Bob, many, many, many other Water Island people worked very hard to make this years' auction the MOST SUCCESSFUL EVER! In addition to all of the volunteers, the auction would not have been as successful if it was not for all of the Contributors AND the Bidders! The artwork, as usual, was the highlight of the auction that resulted in VERY spirited bidding. To say that we have some very talented artists on Water Island is a huge understatement. The artists contributing this year were; Carol Richardson, Diane Kwiecen, Pat Cheesborough, Linda Gidley, Sandy Myers, Arthur LaFranchise, Sue Miller, Sue Bubb donated a Water Island Giclee print, Kathy Butler, Patty Stricker donated two art works by Marsha Stein and Fish Face donated an underwater photograph tittled Blue Tangs. Here are more photos, courtesy of Carol Richardson, from the 2016 WICA Auction. Posted March 12, 2016 Water Island Search & Rescue (WISAR) has shared some very important information about tsunamis and how Water Islanders can best be prepared. Check out all the latest information from WISAR by clicking the "Search & Rescue" button in the top menu or go here now. More Treasure at the Annual Auction! 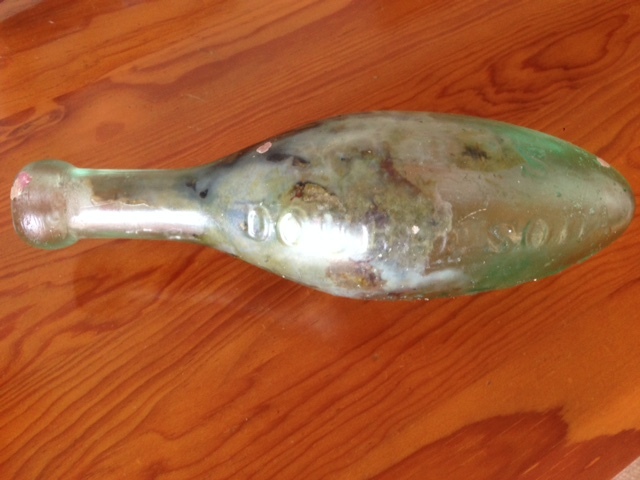 Posted March 3, 2016 Coming up for bid at the Annual Water Island Civic Association Auction on March 12th at 9:00Am is this Torpedo bottle. Circa 1850. The Torpedo bottle is embossed with "Webb's Double Soda and other Waters to Her Majesty Islington London". 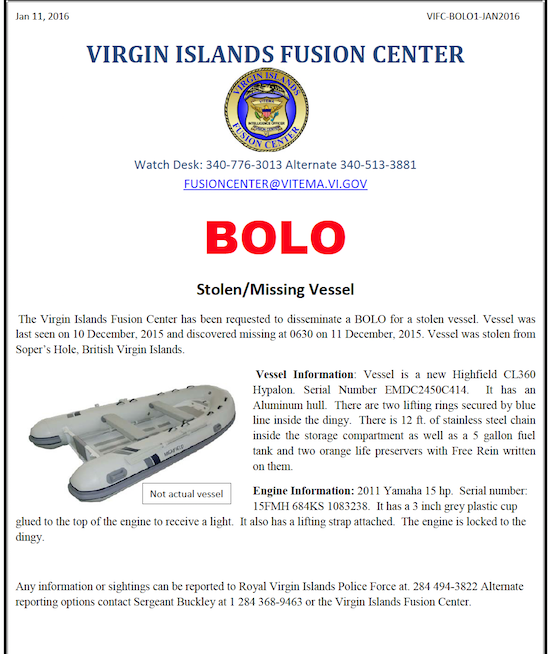 It was recovered from the waters off of St. Thomas. Own a piece of history! Posted February 27, 2016 To all who knew and cared for Mary Ann Starr, we are sad to say that she passed away on Monday, February 22, 2016. 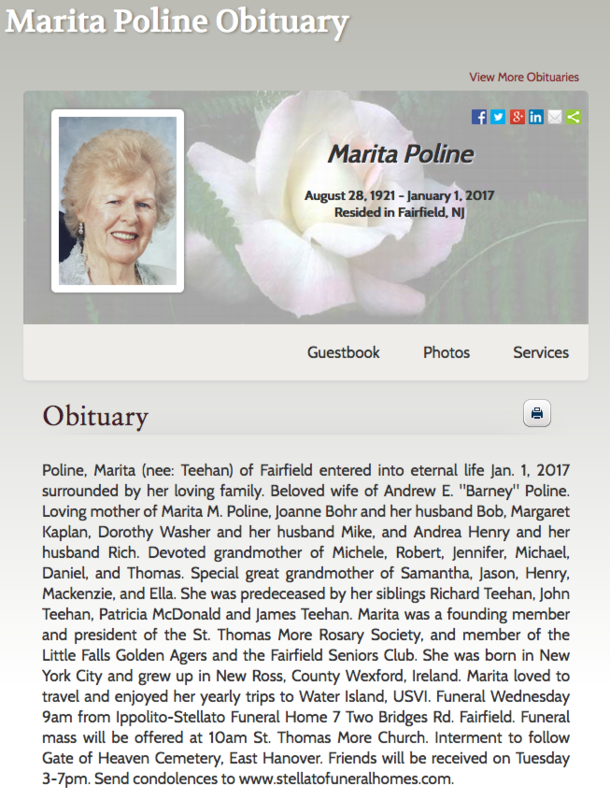 After a long struggle with dementia, Mary Ann passed away peacefully. Mary Ann and Her husband, “Hap” Starr lived on Water Island from the early 1980’s to 2009. 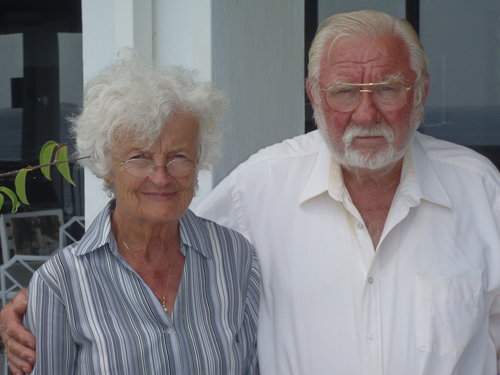 Mary Ann and Hap contributed much to Water Island. As an example, Mary Ann took it upon her self to be responsible to empty the trash can at the dock on a regular basis and she was always donating her time to our civic activities. If we receive further information, we’ll pass that along as well. WOW! At The Auction This Year! 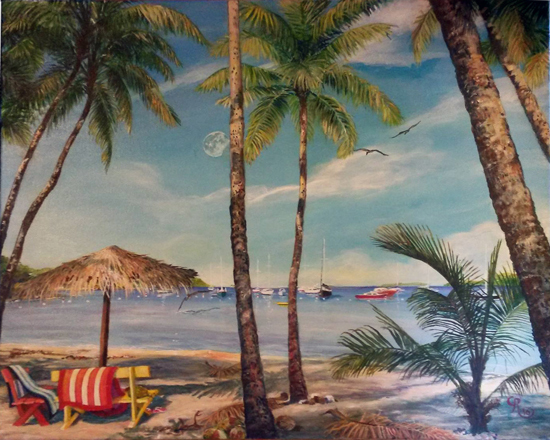 Posted February 23, 2016 This year at the Annual Water Island Civic Association Auction on March 12th everyone will have a chance to bid on this beautiful paiting by our own Carol Richardson! Make sure you DO NOT MISS THIS. Carol's paintings are a prized item every year and we think she has outdone herself this year. 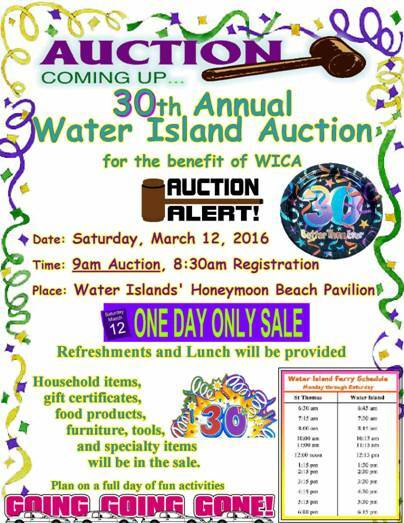 Don't forget, WICA Auction on March 12th starting at 8:30am registration. The actual auction begins at 9:00am. See you there! Posted February 8, 2016 The Annual Auction is setup and run each year by a large group of volunteers. It really does take an entire island full of workers, in the weeks leading up to and during the auction, to make it successful each year. So, please make some time available to be one of the many who volunteer their services. To find out how you can be a part of this annual event, please contact Mercy Blosser at (340) 690-5591, or by email: mercyrocks2000@yahoo.com. 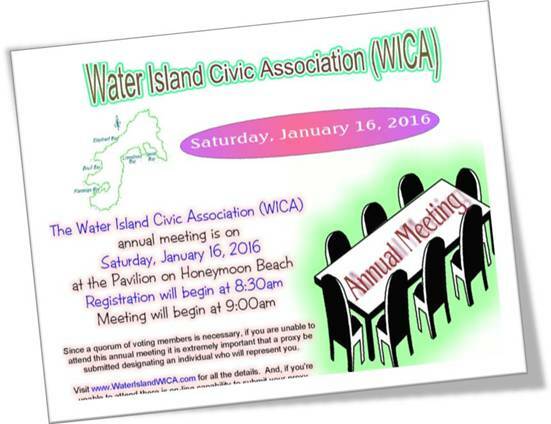 The Annual Meeting package was sent via email to all WICA members with a request that a Proxy be returned by any member who is not going to be able to attend the meeting on Saturday, January 16, 2016. As of this date only nine proxies have been received, so we want to again extend the reminder of the importance of submitting a Proxy if you’re unable to attend the Annual Meeting. An email sent to RockyDock@gmail.com listing your name, and who you designate to vote on your behalf, can be used as your Proxy. Or, by going to www.WaterIslandWICA.com the capability exist, in the Members Section, to complete and submit the on-line Proxy. 11th Annual Water Island Music Festival is sponsored by the Randall Family on Water Island, who utilize their home at Providence Point, as the concert venue. For further details and seating reservations please call 340 514-9995 in the evening hours.